Everything went without a problem. Beautiful clean car and a competent driver. I was very pleased with the pick up and prompt service to my hotel. 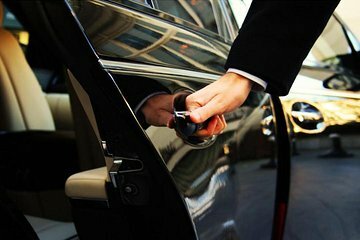 Use this car service and avoid the local taxi from the airport. This is the only way I travel anymore, and this time was so well worth it. I got delays 2 hours due to trying to secure a 72 hour visa late at night. I did call to let them know I was running late, and after I finally got out, there was my driver with my name tag ready to navigate me to my hotel. The nice thing about Viator is that on this trip, I needed two such pickups, one in Beijing and one in BKK, and in fact also had a Great Wall tour, all easily accessible, and was offered some discounts for further tours, which I am planning to do in Bangkok. Prise en charge à la sortie des arrivées comme prévu. Very disappointed in this service. My only real complaint about my China experiences. After flying so many hours from JFK, I had to wait one full hour for driver who apparently went to wrong terminal or was otherwise lost at airport. Disappointing to say least.. as I was tired, but had to wait and wait and wait. I expected immediate pickup as soon as I went thru customs! !